. . .Using scare tactics and worse-case scenarios, leaders in Congress including Minnesota Sens. Amy Klobuchar and Norm Coleman and Wisconsin Rep. Ron Kind told us that we simply must ship billions of dollars as quickly as possible to the Treasury Secretary and Federal Reserve Chairman Ben Bernanke or else the economy was going to crash and burn. Even worse than it already had. . . .
. . .The bailout package has been a textbook example of how many wrongs by the government doesn’t make anything right. The administration, along with a Democratically controlled Congress, scared the American people into signing a blank check with a few vague promises. The administration insisted that too much oversight on people like Paulson and Bernanke would only hurt the American economy. And now the American public isn’t even getting what it was sold — help to homeowners and taxpayers who got tangled up into this strange mortgage crisis. . . .
•It lacks taxpayer protection, and there is no guarantee the American people will get their money back from Wall Street. The legislation simply requires that if, after five years, we have not gotten a good deal on our investment, the president must make a proposal for doing so. That proposal is not binding and will likely go nowhere. •It offers no real help for homeowners. As the New York Times reported on Saturday, the way the plan is structured makes it highly unlikely that more than a handful of struggling homeowners will end up with more manageable mortgages. •It continues to permit excessive CEO compensation by instituting so-called limits on compensation and golden parachutes that are essentially all bark and no bite. As the Washington Post puts it, "executive pay experts said the regulations are too weak to spark major reform in the way companies compensate top officers, and too narrow in scope to change the pay structure that encouraged finance executives in boom times to take on enormous risks." •The plan proposes only weak oversight by putting enormous power in the hands of the treasury secretary, leaving an oversight board that can critique but not halt any of his actions. Too many public opinion leaders, including those in the media, committed the cardinal sin of panicked policymaking and fiscal recklessness: They fell prey to the delusion that just throwing a lot of money at a problem would solve it. . . . Despite a lame-duck Congress and a nearly useless president, our leaders should show some kind of leadership and ask the tough questions. What are we getting for our money? Why are homeowners still aching? And who’s looking over Paulson’s shoulder? We’re not sure what’s worse, not getting what we paid for or no one in Congress willing to speak out about how the bailout money is being used. We understood that politicians were distracted by the recent campaigns — now what’s their excuse? Walz wasn't distracted by his campaign--far from it. On September 24, he sent Treasury Secretary Paulson a letter including eight questions about oversight and transparency. When these questions weren't addressed to his satisfaction, he voted against both versions of the bailout package. The Strib reported that his no votes (the Strib's board favored the biils) put him in the spotlight. We'll have his current position (not much has changed, although the guy's looking pretty prescience these days) in the article we're working on that's based on Friday's interview. We understand that the news staff and the editorial board aren't one and the same, but if the WDN wants the opinion of Winona's congressman about these things--he'll be quite happy to talking to a reporter about issues, campaign or no campaign. These sorts of governing and policy-making issues are why we care more about what Cognressman Walz is going to do as a U.S. representative about drafting the new transportation bill, creating a job stimulus package and the like, than we do about handicapping the gubernatorial horse race. Oversized semitrailers carrying wind turbine parts are becoming a common sight in central Minnesota. From June through September, the Minnesota Department of Transportation reports granting more than 2,400 permits for oversized wind loads. That kind of travel frequency is causing some safety concerns. Ted Coulianos, a MnDOT permit supervisor, says people aren't sure how to drive when sharing the road with a semi carrying huge wind turbine parts. But Coulianos says motorists should be prepared to see more such loads in the coming years as the demand for wind energy keeps going up. Much of the turbine parts in the Upper Midwest arrive by ship at the Duluth port before being transported to other parts of Minnesota, Iowa and other states. We've personally encountered at least ten of these transports in the last few months. We never had a problem figuring out how to share the road with the transports. We were far more perplexed by our questions about why the turbine parts were being shipped from Europe rather than being manufactured here in the Upper Midwest. Not only would local fabrication create jobs, but it also might serve to reduce the equipment's carbon footprint. Workday Minnesota's article Euphoria over Obama win tempered by Senate recount cites the work done by Rochester-area labor leader Russell Hess and Southeast Area Labor Council field representative Liz McLoone in getting out labor volunteers and the vote. Hess was co-director of Minnesota Labor 2008. Members said he had a phenomenal knowledge of their districts, and he kept up to date well after the campaign ended. Rep. Tim Walz (D-Minn.) said one of his supporters wrote a letter to the editor of a small paper in his district, complaining about his vote on a rewrite of the Foreign Intelligence Surveillance Act. Walz mentioned the letter to the editor to Emanuel on the floor and was stunned by his response. Fortunately, Walz broke with Emmanuel's assessment, and took the just criticism of his initial FISA vote by constituents to heart. He voted for the RESTORE Act in November 2007 and voted against the second bad bill that passed in June. The final bill, which authorized warrantless wiretaps, was supported by Emmanuel and Pelosi. Walz's Republican opponent told the Mankato Free Press that he would have voted for the bill. While we at BSP are trying to focus on the coming policymaking by the 111th congress and President Obama, others in the blogosphere are looking at the 2010 Minnesota governor's race. Mankato Free Press night editor Doug Wolter ups the stakes by proposing a Sarah Palin--Paris Hilton presidential ticket for 2012 in Celebrity politicians: It's the wave. The silly season never ends. Image: how quick the WDN editorial board forgets. 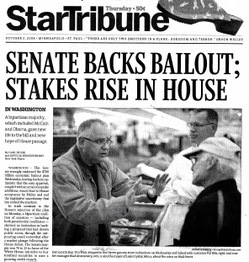 A photo of Congressman Walz talking to constituents about the bailout appeared above the fold in the October 2 Star Tribune. The Strib chastized Walz for being "reckless" in voting against the bailout. Okay then.